Who feels like talking about Yoga Practice today? I’d also like to discuss how pretentious I feel calling it My Yoga Practice. (It makes me feel pretentious. That’s it.) I have a weird relationship with yoga because I love it so damn much, but never seem to stick to it with anything vaguely resembling regularity. My devotion to yoga fluctuates wildly, and unfortunately tends towards the neglect side of things whenever I could really use it. As soon as I start to get busy or stressed, or busy AND stressed, I just can’t drag myself off the couch or away from my desk. I suspect this is a pretty normal response for most people, but I want to know if anyone experiences the next stage of this process the way I do. See, what happens next is I go back to yoga once, and fall in love all over again. Then I wonder why I keep denying myself something I love so much. 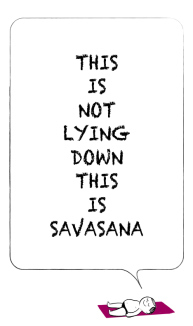 This revelation is followed by The Yoga Upswing. The Yoga Upswing involves super healthy eating, juices, cutting down on TV time, and increased time spent googling yoga retreats in Bali. (Oh, and lots more yoga too) Last week, I actually bought something tie-dyed. Yoga is both spiritually and physically important to me, and the practice keeps me feeling grounded. I like to live in my head way too much, and yoga reminds me that it’s not the best idea to always do that. So, who has some tips on how to balance a healthy yoga practice with real life? I’ll be waiting over here with a kombucha fuelled chakra headache. Next Post What are your eco-hacks? Hahahaha. Jen, You’re the best. I loved this. Totally happens to me. I have found that the key is balance and flexibility (ha)- seriously though! Whenever I have stopped yoga and the upswing (love that) has lost it’s momentum, there eventually comes a day when the desire for a little inner peace sets in & I remember how great Yoga is; then I go nuts, burn out and the cycle repeats. As for the kombucha… every now and then…. it’s followed by a cookie. Haha, glad to hear you do the same thing Mel 🙂 I like your advice, especially the cookie bit! I definitely need to find a good yoga DVD for when I’m in the lazy part of that cycle. It depends on what you define as ‘yoga’. You can still practice yoga without going through the asanas. Think about the yamas and niyamas, that is a spiritual practice. If you are honest in actions and words, that is yoga. Also, brief breathing exercises in the morning can awaken the mind and all that mumbo jumbo. Maybe not going too overboard is the key to consistent practice? I find I go all out or none at all. I’m trying to find a balance. I hope to find that yoga up swing. I am just starting a “practice”. I love yoga too-particularly Friday night candlelight yoga but with teaching every night it’s hard to want to work out in the am.